Please read carefully before entering the show. 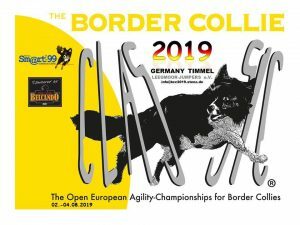 Participation is open to all Border Collies with a pedigree recognized by the Kennel Club from the country of birth. Dogs must have reached the age of 18 months on the day of the competition. 1st grade combinations are eligible to enter on Friday 2nd August 2019. 2nd and 3rd grade combinations are eligible to enter the European Championship from Friday 2nd August to Sunday 4th August 2019. It is not possible to enter for just one day. Competitors will run 3 or 4 courses (to be determined by the organisation, depending on the number of entries). Prizes will be awarded for the top 3 winners of each course. 2nd and 3rd grade run separately on their own courses. All competitors will run 6 courses: 3 agility and 3 jumpings. On Sunday there will be two finals: the National Team Final and the Individual Grand Final. The results from the Agility 1, 2 and 3, and the Jumping 1, 2 and 3 will count for a place in the Individual Grand Final. For 3rd grade, the top 10 placed combinations (= handler & dog) per round will be invited to take part in the Individual Grand Final. For 2nd grade, the winners of each round will be invited to take part in de Individual Grand Final. This means that the maximum number of participants at this final will be 66. In the event that one or more combinations qualify at two or more courses, the open spaces will not be filled. The title „BCC2018 Champion“ will be awarded to the winner of the Individual Grand Final. National teams will compete in the National Team Final on Sunday. Each national team consists of the three best 3rd Grade combinations and three best 2nd Grade combinations from that country. The combinations qualifying for the Team Final are determined by the combined results of the 3 agility courses run on Friday and Saturday, per Grade. If there are countries with less than 3 participants in 3rd Grade and/or less than 3 participanst in 2nd Grade, the organization will combine countries into ad hoc country teams.It is not allowed to replace the qualified combinations in a country team, f.i. in case of injury. In such case, the country team will run with less than 6 combinations. The National Team Final will be an Agility course. To determine the winning country in this Final, only the results of the four best combinations of a national team will count. Of all the dogs running finals (team and individual), the chip needs to be checked when leaving the ring. Randomly during the tournament, chips will be checked. The FCI rules and regulations are applicable to this show (see www.fci.be). Dogs with a height of 43cm or over: category Large. Dogs with the height 35cm or over, but less than 43cm: category Medium. Large dogs will jump 60cm, Medium dogs will jump 45cm. In the finals (individual and country) only Large dogs can participate. Medium dogs can compete in the Agility 1, 2 & 3 and Jumping 1, 2 & 3 courses on Friday, Saturday and Sunday, they will have their own ranking. The best Medium dog calculated over these six courses will be awarded with “BCC Best Medium 3rd Grade” and “BCC Best Medium 2nd Grade” respectively. At the event, you need to be able to proof (e.g. with a record book or an official declaration issued by your national Kennel Club) in which Grade the dog is allowed to run. This will be checked randomly by the origanisation. The organization reserves the right to refuse entries, and make any alterations they may consider necessary in the event of unforeseen circumstances. The maximum number of combinations for the 3rd Grade on Saturday and Sunday is 300. The maximum number of combinations for the 2nd Grade on Saturday and Sunday is 300. Registration is from 1st of October 2018 until 15th of October 2018. In the event the maximum number of entries is exceeded during this registration time, a draw will be made. • interfering with the safety or chance of winning of an opponent. No person shall carry out punitive correction or harsh handling of a dog at any time within the boundaries of the show. All dogs will be entered at this show at their owner’s and/or handler’s risk. Whilst the organization and helpers will undertake every care, they will not take responsibility for loss, damage or injury howsoever caused to dogs, persons or property. All competitors must have a third-party insurance. In the event of abandonment of the show through circumstances beyond the control of the organization, expenses will be defrayed from the entry fees to cover the cost of the preparations for the show. There will be no practicing/training allowed in the rings or at the venue during or after the show. No food or toys will be allowed in the ring. Dogs should be kept on a lead, no longer than 2 meters, except in the exercise area or when working. A handler working more than one dog in the same class must ensure that the dogs compete in the sequence in which they are drawn (according to catalogue). Failure to do so may result in elimination. It is the competitor’s responsibility to be available for their class and running order, and to visibly wear their number. Dogs must be handled by the same handler throughout the whole event. It is not allowed to switch handler during the event. People or dogs acting in an unreasonable/irresponsible manner will be removed from the show and forfeit all fees paid. All under 18’s must be accompanied by an adult, who will be held responsible for their conduct for the duration of the show. Please clean up after your dog and deposit in the containers provided. Competitors consciously ignoring this request will be asked to leave the showground without restitution of their entry fees. Bags will be provided by the organization and will be available throughout the showground. Please, don’t forget we are guests at Timmel and we kindly ask you to show respect to their rules and regulations, other campers and guests. All that remains is the good luck wishes from the BCC committee and don’t forget to enjoy yourselves.